The National Science Foundation and its staff are deeply concerned for the people and organizations in the areas affected by natural disasters, and their aftermath. Affected researchers and organizations can be assured that they have our support. 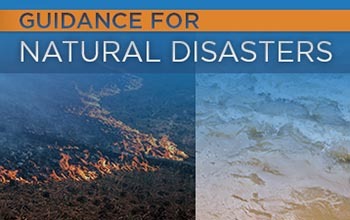 For individuals from organizations affected by recent natural disasters and considering submission of new proposals, NSF will be flexible regarding meeting stated deadlines. Researchers or sponsored projects office staff from organizations that have been affected by the natural disasters and are unable to meet stated deadlines should contact the cognizant program office to discuss the issue. NSF will consider extensions to the submission deadline on a case-by-case basis (and, in a few cases, on a program-by-program basis), understanding that it may be particularly difficult for individuals impacted to contact the Foundation. See NSF Proposal & Award Policies & Procedures Guide (PAPPG) Chapter I.F for additional information on procedures for submitting such requests. When freed from natural disaster-related difficulties and responsibilities, investigators on current NSF awards should contact their Program Officers as soon as feasible to discuss how each NSF-supported project has been impacted. We also have established an email address — naturaldisasters@nsf.gov — for inquiries from organizations, faculty and students on NSF awards for issues related to natural disasters. The Foundation will post updated information regarding specific, timely, and relevant research assistance opportunities on NSF.gov. We encourage you to visit the site regularly. In addition to standard research proposals, NSF also has the Rapid Response Research (RAPID) proposal type. This type of proposal is used when there is a severe urgency with regard to availability of, or access to, data, facilities or specialized equipment, including quick-response research on natural or anthropogenic disasters and similar unanticipated events. See PAPPG Chapter II.E.1 for additional information on RAPID proposals.